Singer, songwriter, guitarist, actor, GARY CLARK JR. (1984.02.15/Austin, TX - ) began playing guitar at the ripe young age of 12. Born and raised in Austin, TX, Gary continued to play small gigs throughout his early teens, until he popped on the radar of legendary promoter Clifford Antone, owner of the Austin blues club Antone's. Through Clifford's connections, Gary soon began sitting in and learning from an array of musical icons, including the incomparable Jimmie Vaughan. Jimmie and others in the Austin music community mentored Gary along his path, facilitating his steady rise, and continued ascent in the Texas music scene. Gary's musical peers, as well as the Austin music community at-large, have showered him with critical acclaim for his galvanized live performances, and fervid expression. At one unexpected point of political recognition, mayor of Austin Kirk Watson proclaimed May 3, 2001 Gary Clark Jr Day. Gary was 18 years old at the time. 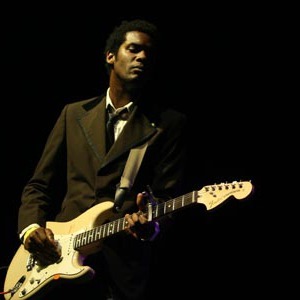 Gary went on to win the Austin Music Award for Best Blues and Electric Guitarist on three separate occasions, in addition to receiving awards from various Blues magazines and associations around the country. After playing the nationally televised show Austin City Limits and touring with the likes of artists such as Jimmie Vaughan, Pinetop Perkins, and Doyle Bramhall II, he continued his recording pursuits by releasing three self-produced albums, and creating the original score for the major motion picture Full Count. His creative versatility allowed him to transcend his own musical talents, while also starring as a principal character in John Sayle's film Honeydripper, alongside actors Danny Glover and Stacy Keach. Originally known as a blues musician and even compared to such greats as Stevie Ray Vaughan, Albert Collins and Albert King, Gary is stepping out...way out. His upcoming CD will really test his blues fans. Will they appreciate Gary's guitar chops and his soulful voice as he explores other genres? Gary hopes so and he hopes they will continue with him on his journey. And with this new sound, we're thinking Gary will pick up some new fans along the way.